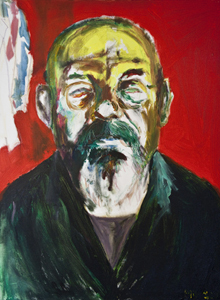 Magic People: Leeds Artist and Performer Mik Artistik showcases a series of portraits in mixed media. An Exhibition at Besbrode Pianos Leeds. Free Event. 6th May to 6th June 2016. Besbrode Pianos Leeds UK. Mik's portraits are created by invitation at his home in Armley during a 4 -5 hour live sitting which he calls "meetings across a canvas". 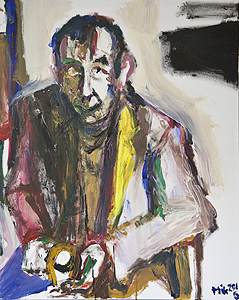 His sitters, initially strangers seen time and again around Leeds at gigs, cinema queues, parties are described as "my cheery sparks", characters who through chance encounters have intrigued Mik over the years. Mik employs the act of portraiture to bridge the divide between strangers. These short sittings allow no second chances. Paint, pastel, brushes, fingers scramble to capture those who "are breaking out of their skin with power, energy and crackle". These large canvasses stand as social documentary of a cross-section of Leeds society and inflate the sitter to a stature bordering on urban myth. These are Mik's magic people, his everyday heroes. Mik Artistik is a Leeds-based artist, musician, comedian, writer and performance poet. He graduated from Bradford College and, despite these other artistic outlets, describes painting as his original passion. Mik Artistik has exhibited extensively throughout his career, including Leeds, Bradford, Wakefield, Newcastle and London. 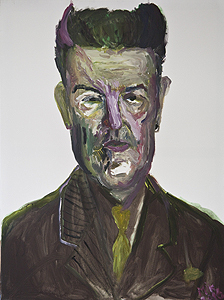 He has exhibited a selection of large oil paintings at the Playhouse, Bradford, and in 2003 exhibited a self portrait with CD at the National Portrait Gallery, London. Artistik also writes songs about his world , performing them in his band "Mik Artistik's Ego Trip" with Jonny Flockton on guitar, Benson Walker on bass,and Mik on mic and keyboards. Mik Artistik’s Ego Trip has drawn enthusiastic crowds at Glastonbury, Latitude, Leeds, Port Elliot Festival’s and bars and clubs throughout the North of England. Besbrode Pianos is a specialist piano dealer and wholesaler based in Holbeck, Leeds. Our extensive showrooms occupy three premises including four floors of a Victorian mill on the edge of Leeds city centre. We permanently display more than 250 new and pre-owned pianos from leading brands offering pianists an unrivalled opportunity to play and compare pianos side by side. We are an an authorised agent for Steinway & Sons and offer the full range of Steinway, Boston and Essex pianos for retail. Besbrode Pianos has recently opened its wall space to artists to exhibit their work. If you are an artist interested in displaying your work in our gallery space, get in touch.